We offer high quality Mix Cotton Rags Wipers Cut Waste in diverse range of colors like red, blue, yellow, green or any other colors. Used for making beautiful pieces of mats, mops, wiping cloth and cloth dolls, the Mixed Cotton Wipers are in great demand. 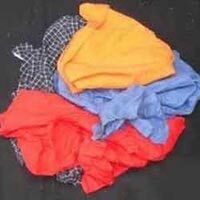 We supply the Mixed Cotton Wiper in small and bulk quantities as per the market demand and client orders.